South Korean pro football club Jeonbuk Hyundai Motors are looking to make history by clinching the 2018 K League 1 title this weekend. Jeonbuk, led by head coach Choi Kang-hee, are having another successful season. The defending champions have yet to give up the top position in the standings since April and are on the verge of clinching their sixth K League 1 title. Jeonbuk will face No. 3 Ulsan Hyundai at Munsu Football Stadium in Ulsan on Sunday. 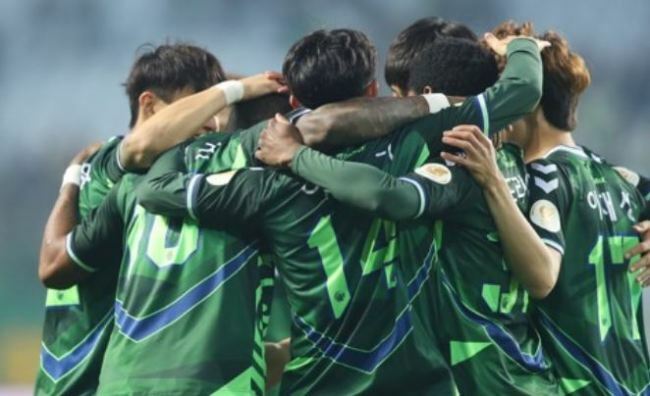 Jeonbuk can defend their K League 1 title if they beat Ulsan and second-place Gyeongnam FC fail to collect a win against Jeju United on the same day. With seven matches remaining this season, Jeonbuk have 73 points on 23 wins, four draws and four losses, 18 points above Gyeongnam. If Jeonbuk edge Ulsan and Gyeongnam lose to Jeju, the points difference between the two clubs will be 21. If Gyeongnam get a draw, then the points difference between the two sides will be 20. In both cases, Jeonbuk will be the 2018 season champions regardless of remaining matches and will become the first club to clinch the title before the league splits into two echelons. South Korea's top pro football division is operated under the split system, in which 12 teams are divided into two groups after 33 matches and play five more matches within their respective groups. Those in the upper group compete for the league title and spots for the Asian Football Confederation Champions League next season, while teams in the lower group focus on avoiding relegation to the second-tier K League 2. Since the split system was introduced in 2012, no team has clinched the title before the split. In 2017 and 2015, Jeonbuk were declared the champions after their 36th match. In 2014, Jeonbuk lifted the trophy after their 35th match. FC Seoul, the 2016 champions, and Pohang Steelers, the 2013 winners, both secured the league title on the final day of the season. In 2012, the first season with the split system, each team had to play 44 matches, and Seoul grabbed the title after playing their 41st match. Jeonbuk can further cement their top dog status in the K League if they win the 2018 season. Winning the current season will deliver Jeonbuk's sixth league title in the last 10 seasons. Jeonbuk will then be one title short of Seongnam FC, which have won the league seven titles.